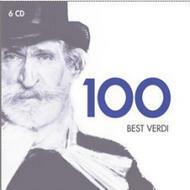 This 6CD set contains 100 tracks from the most familiar and best-loved works by the Italian composer Giuseppe Verdi, performed by many of the world�s leading singers, orchestras and conductors. The operas of Verdi today form the mainstay of the repertoire of opera houses all over the world. Some of his music has become absorbed into popular culture, from being used in TV adverts and film soundtracks, as well as being performed by the most famous classical singers of the day in concerts and on records. CD 1 brings together many of Verdi�s great arias for tenor and baritone, from the swaggering bravado of �La donna � mobile� from Rigoletto to the heartbreaking poignancy of �Niun mi tema�, the death scene from Otello, Verdi�s inspired setting of Shakespeare�s tragedy. The first singer to be heard is the matchless Placido Domingo, and he is followed by a procession of other great tenors including Jos� Carreras, Luciano Pavarotti, Rolando Villaz�n and Roberto Alagna, as well as some of the world�s finest baritones such as Tito Gobbi and Dietrich Fischer-Dieskau. CD 2 presents a veritable galaxy of great sopranos and mezzos, led by the legendary Maria Callas and including Natalie Dessay, Victoria de los Angeles and Montserrat Caball� who provide a programme of the greatest Verdi arias for the female voice from operas like La traviata, Rigoletto, Un ballo in maschera and Aida. In CD 3, the singers come together in pairs for a programme of some of Verdi�s finest duets, the first of which is the irresistible brindisi: �Libiamo� from La traviata sung by Angela Gheorghiu and Roberto Alagna. Some of the major stars heard on this CD for the first time include Beverly Sills, Renata Scotto and Birgit Nilsson. CD 4 is a collection of great ensembles, beginning with the famous quartet from Rigoletto and including some of the most powerful passages from Otello, Don Carlo and Aida. The CD finishes with the scene from Verdi�s comic masterpiece Falstaff where the women make fun of Sir John�s clumsy efforts to woo them in one of the most brilliant pieces of quicksilver vocal writing in all opera. CD 5 contains many of Verdi�s best choruses, from the lively Anvil Chorus from Il trovatore to the deeply moving Chorus of Hebrew Slaves: �Va, pensiero� from Nabucco. The disc finishes spectacularly with the Grand March and Chorus from the Triumphal Scene in Aida. CD 6 brings together some of Verdi�s powerful overtures to operas like La forza del destino and Luisa Miller, the deeply moving preludes from La traviata and Aida and some colourful ballet music from Macbeth that Verdi added for its French production. It ends with extracts from the �Four Seasons� ballet from I vespri siciliani, also written specially for its premi�re in Paris. 7. Rigoletto (1995 Digital Remaster) - Pari siamo! 16. Scene 2 (1989 Digital Remaster) - Aida: Che veggo! Egli? Mio padre! 5. Act I - Evviva! beviam! beviam! 12. I Lombardi alla prima crociata - Gerusalem!